Enjoy some of the best casual dining in downtown Rochester, MN right here at Kahler Inn & Suites. CB3 Burgers & Brew offers a casual dining experience for lunch and dinner in the heart of the Mayo Clinic complex. Stop in for a refreshing lunch of handcrafted sandwiches and gourmet salads. Scrumptious starters include Ray & Frank's Wings and the Meatlover's Flatbread, perfect for sharing. Meet up for dinner and enjoy one of 10 savory specialty burgers, or try the St. Louis style ribs that fall of the bone. CB3 also offers vegetarian and gluten free dishes, so check out our lunch & dinner menu. Relax at the bar and sip on craft beers, wines, and specialty drinks, and unwind at our Happy Hour from 3 pm to 6 pm daily! If you are stepping out, there are many great places to eat near the hotel. Jimmy John's and Caribou Coffee are steps away, and if you are craving finer dining, Lord Essex the Steakhouse - a premier steakhouse and Salute Wine Bar and More featuring small plates and light Italian cuisine are ideal choices! 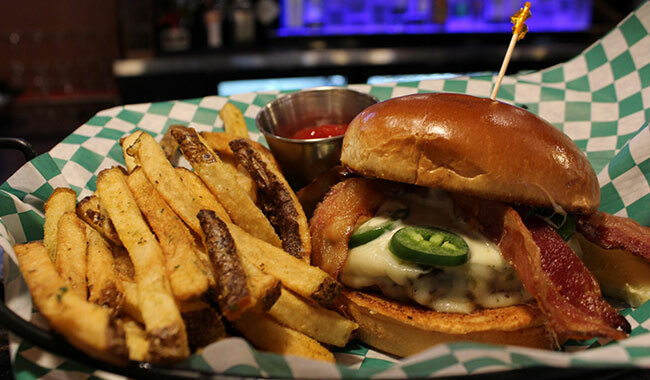 CB3 has a sports bar feel a great menu that features hand-crafted burgers, hot dogs, salads and sandwiches. Enjoy 22 craft beers on tap and their famous adult milkshakes.